I have likely shared this somewhere in the social media/blog-o-sphere but I have never had a cup of coffee. Crazy, I know. I have nothing against coffee whatsoever but I personally do not enjoy the taste. The smell on the other hand, oh my gosh. I bought Jord a coffee maker last year for Valentine’s Day just so I can smell coffee in the apartment on weekends. After I tell someone coffee isn’t my thing, they figure I drink matcha or green tea. I then surprise them again and say how I’m personally not a fan of the taste of matcha. It is a bit too strong for me and even when it is masked in a latte or dessert, I’m just not into it. This also really limits my caffeine intake too since I don’t drink caffeinated tea either. The only form of caffeine I get is from kombucha or chocolate. Just call me the natural energizer bunny because I don’t know how I am still going. It is likely because I have never been caffeine dependent. Not going to lie though, I do often feel left out when everyone is drinking their fancy af lattes with cool unicorn designs and walking around with bulletproof coffee. 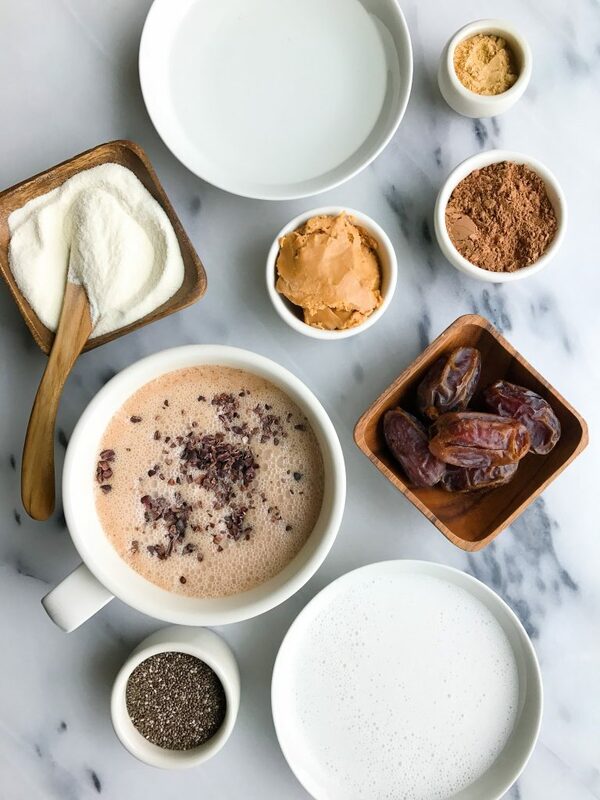 That is why I made this Magical No-Coffee Cacao Collagen Latte. 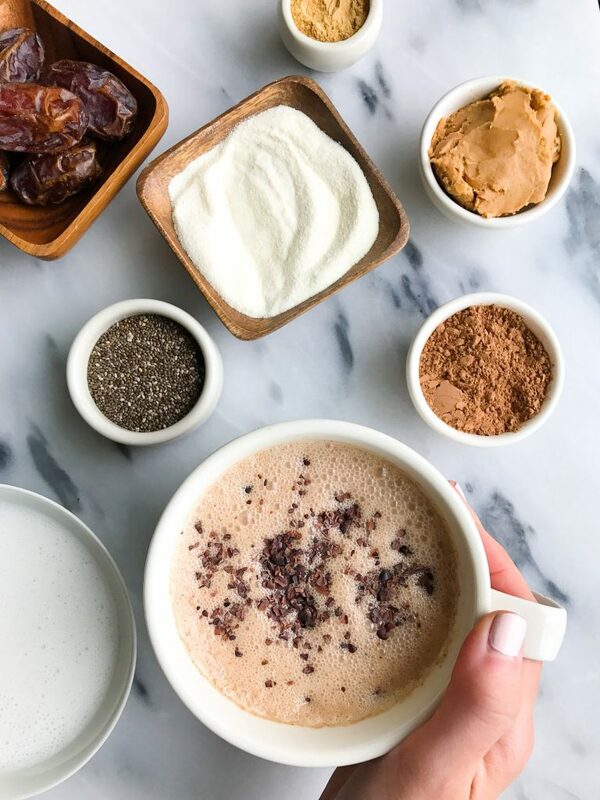 And yes, I do think it is quite magical to drink 😉 It is so nourishing and satisfying and filled with some of my favorite ingredients. I use New Barn’s amazing Barista blend. 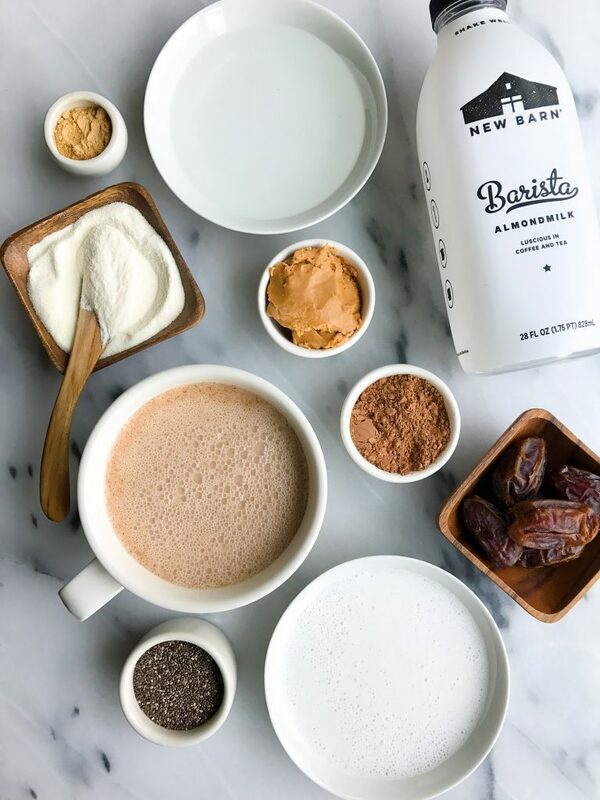 If you ever by coffee from Whole Foods at Allegro Coffee and get almond milk in it, it is New Barn Barista blend. It gives that luscious creamy addition to your beverage and it blends amazingly well both hot and cold. 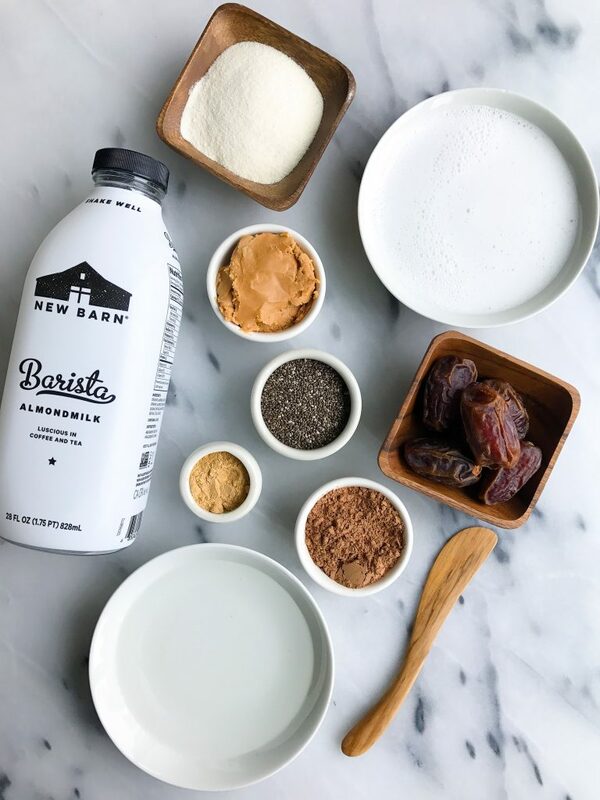 I use New Barn almond milk daily in my home. It is a staple in my fridge and it is actually an almond milk I trust. It is made with organic almonds and no funky ingredients or carrageenan inside. The even have a Whole30-friendly bottle and it saved me a massive headache when Jord was doing Whole30 a few months ago. The best part about this no-coffee drank is also how versatile it is too. I give you a rundown on what ingredients I use to make it “magical” but you can switch it up and really use anything you wish. Thank you The New Barn for sponsoring this post. It means so much to me to work with brands that I love and who support rachLmansfield! This looks so good! I’ve been trying to cut back on coffee but I still miss having that warm drink in the morning to start my day. I definitely think this will be a good substitute. Can’t wait to try! Thank you so much for this ! I recently gave up drinking coffee and have missed a go to drink, I can’t wait to try this ! Sounds amazing!! Can you sub coconut oil for the coconut butter? i haven’t tested that but let me know if you do!